Not only are those solid words of wisdom – shared by Broad College MBA alum Priya Balasubramaniam to newly-minted graduates during fall 2017 commencement exercises – but they are also the values that have put Balasubramaniam among the top female engineers in the world. Balasubramaniam, vice president of iPhone operations at Apple Inc., was recently honored by Business Insider as the fourth most powerful female engineer just ahead of International Women in Engineering Day in June 23. That is up one spot from her rank the previous year. 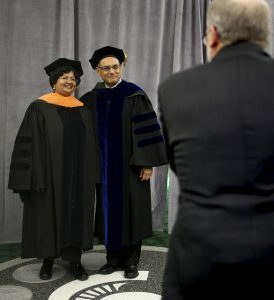 Additionally, Balasubramaniam “continues to set new benchmarks of accomplishments and success for Michigan State University’s Broad College of Business alumni,” said Sanjay Gupta, the Eli and Edythe L. Broad Dean of the Broad College of Business. 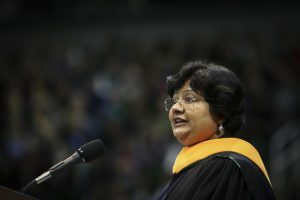 Balasubramaniam, who earned her MBA in supply chain management in 2001, told graduates last winter that living the life you wish to live; lifting up yourself and those around you; and learning from your life and others are critical to unlock your potential and purpose, as she did. Balasubramaniam launched her career with Apple straight out of the Broad MBA program. Last year, the Wall Street Journal reported she was instrumental in negotiating a new deal to manufacture Apple products in India, one of the world’s fastest growing smartphone markets.